To sail is to be dictated by nature. The sea chose rhythm and route for our first Hebridean sailboat trip. We started from the Isle of Eigg, spending the evening crossing to mainland, then overnighting onboard and sailing north to Mallaig the following day. During this fantastic new experience we swam in the sea, ate an amazing Norwegian breakfast and saw a breathtaking Hebridean sunset! This was Thea's first sailing experience and we both felt overwhelmed by the feeling of "wind-travel". This post is about our very first sail trip on the west coat of Scotland with our new friend and skipper Celia. This post was made possible with help from the Slow Adventure in the Northern Territories (SAINT) project. Read more about our fantastic new sponsor here! Although this post is sponsored, all opinions are our own. Ceilia's boat has the most wonderful name: Selkie! On hearing the name of Celia's boat we both chuckled and thought of the Selkies we learned about on the Faroe Islands. Selkies are mythical sea creatures and we've heard stories about them in Norway, the Faroe Islands, Scotland and Ireland. The short story is that Selkies live as seals in the sea, but shed their skin to come ashore as beautiful humans once a year. Read more about the Faroese Selkies here. We doubt Celia's boat to be a real Selkie, but it was very nice to be reminded of our common mythical-nordic relationship! Our Skipper Celia on her boat "Selkie"
Selkie Explorers are based on the Isle of Eigg, a beautiful Hebridean island with a unique history (you can read more about the slow life on Eigg here). It was getting late when we got everything on to the boat resulting in a stunning Herbidean sunset farewell! With the setting sun colouring our world gold, we got to work. Everyone was busy working to get the sails up and the boat out of the bay. Everyone except Thea, who was too occupied with capturing the sunset flares on camera! Led by Celia, Mark and Dioni got the sails up and Anna - Thea's mum, took the helm! After some fumbling about (due to us rookie sailers) we were sailing out of the bay with the bow headed at the Singing Sands at Kentra. Sailing is all about being in rhythm with your surroundings. We feel we become more honest and true when we're in tune with our surroundings. This is perhaps our favourite aspect of slow adventure and why it's so important to us. The way slow adventure connects us to a place, provides better travels which provides a better life. Taking time out to connect, might just be one of the most difficult and important things we do in modern life. By practicing we can all become more comfortable in nature. So, what did we feel like when we woke up in a sailboat? We felt like a morning-swim in the sea! Then, a long beautiful breakfast and a slow sail north to Mallaig. Navigating with a darkening sky can be a challenge, but Celia showed Mark how to read the GPS, so he could help navigate. Late at night, we arrived at the Singing Sands at Kentra (Camas an Lighe in Loch Ceann Traigh). A beautiful bay on mainland Scotland. We lowered the anchor, and luckily Anna brought Aquavit from Norway so we could all have a dram, as is the tradition once you've anchored up for the night in Norway - hence then name Ankerdram! All anchored up, Celia and Dioni made a beautiful dinner with local ingredients and fresh salad from Celia's garden on Eigg. It was so welcoming to smell and hear the sounds of a heartwarming dinner being prepared below, as we were enjoying the last rays of sunlight (and the ankerdram) above deck. 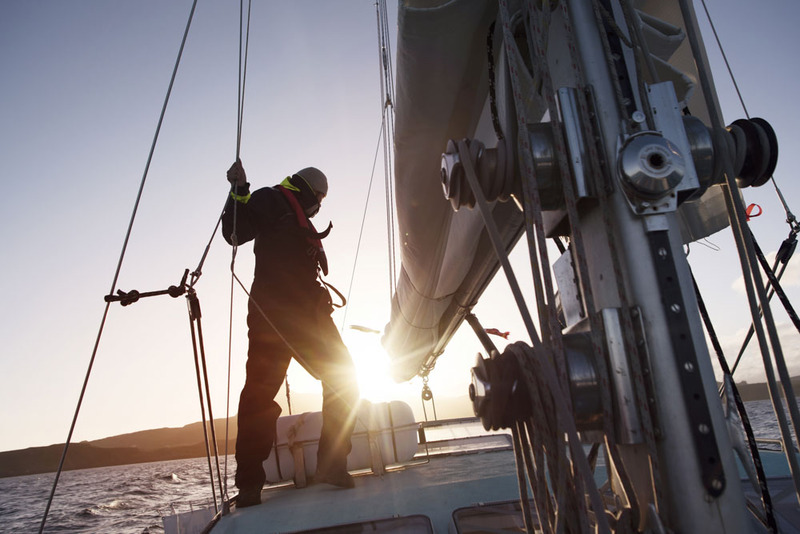 A small group of people, working together - the sailboat environment is a great place to do just that. On Selkie, we were hugged together by the rhythm of the sea. We helped each other and learned from each other, needed and appreciated each other. 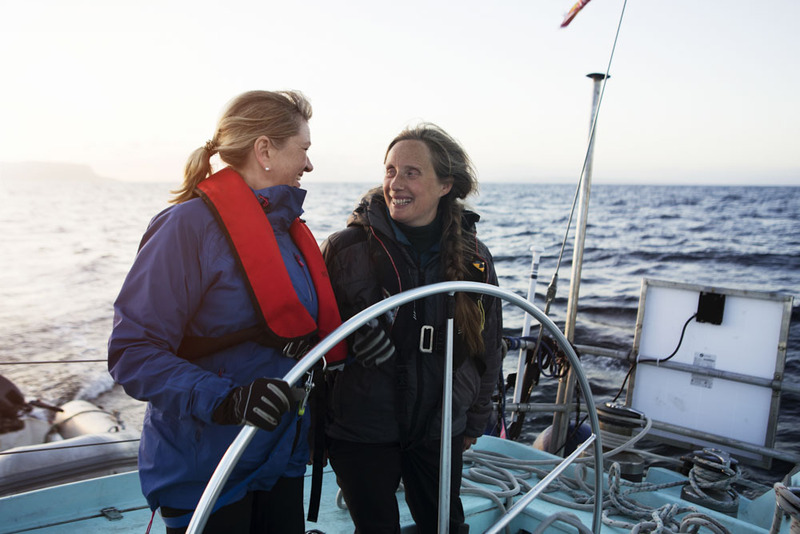 We only sailed for two days, but we can easily imagine how a sailboat would be a fantastic place to connect with others. Sleeping in a sailboat is no problem when you are sheltered from the big waves in a sheltered bay. As a surprise, Celia and Dioni made a fantastic 17th of May (Norway's constitution day) breakfast for us, fully decorated with Norway flags and treats - Thea and Anna were in their element!